Sarabeth Levine. All photos by Quentin Bacon. It’s no surprise that Sarabeth Levine wrote a breakfast cookbook—Sarabeth’s Good Morning Cookbook: Breakfast, Brunch, and Baking (Rizzoli)—only that it took her so long to do so. For 25 years, Levine has been credited with making the first meal of the day an occasion to remember. 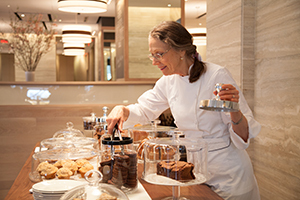 Breakfast at her growing network of Sarabeth’s restaurants, with their delicious yeast-risen pancakes, fluffy waffles and tender omelets—not to mention a basket of pastries served with her world-famous preserves—is a tradition in New York and far beyond. And to think it all started with a jam recipe. Divorced after nine years of marriage and with two young daughters in tow, she found herself looking for a career to call her own, something to inspire her and support her children at the same time. She turned to her mother for comfort. “Look at me,” Levine told her mother, Dore Blume. “I’m a single mom. A nobody.” Blume refused to listen. As a young model she had met Levine’s father, a furrier, at a modeling assignment and married, raising Levine and her four siblings in a Reform Jewish home on Long Island. Eventually, Blume opened a fur shop of her own, setting a powerful example for Levine in an era when career women were still a rarity. But back to those preserves. Levine managed to procure a highly valued marmalade recipe from an aunt’s French relative, which she began making and giving as gifts. People went wild for it, begging her to make it available commercially. Around the same time, she joined a singles group on the Upper West Side, where she met Bill Levine, a divorced father of three, who today is her husband and business partner. “I was at the lowest point in my life when I got that recipe,” said Levine. “And soon after that I met Bill. My mother had been telling me, ‘You just haven’t found your somebody yet.’ And she was right.” Levine credits Bill with managing the “intense” parts of the business, allowing her to focus on creative vision. Today there are 13 outposts of Sarabeth’s, including two in Japan and several inside Lord & Taylor department stores—not to mention 16 flavors of preserves. If you have ever been to one of the restaurants, especially on a weekend, you know it’s a busy experience. That is why Levine recommends cooking from her book instead. “It’s quieter, calmer, more relaxed. No banging pots and pans in the kitchen!,” she said. “And you get to choose from 100 recipes,” many of them with firm Jewish roots: Fat-and-Fluffy French Toast is made with halla; Jam Mandelbrot calls for a homemade version of Sarabeth’s original specialty, fruit spreads; Amma’s Hungarian Coffee Cake incorporates a babka-rolling technique; and there is even a recipe for cheese blintzes! Though many of the book’s dishes resulted from Levine tinkering at home—and feeding the experiments to one of her and Bill’s combined 12 grandchildren—this waffle emerged straight from the restaurant kitchen. Finding herself with a large quantity of leftover mashed potatoes, Levine and her chef created a batter inspired by a favorite recipe, her friend Mimi Sheraton’s potato latkes. 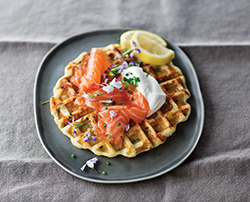 Greaseless and eminently garnishable, Levine tops these waffles with gravlax and crème fraîche (or you could finish the waffles with applesauce or one of Sarabeth’s fruit preserves for a sweet-and-savory breakfast or brunch experience). Serves 5. All recipes from Sarabeth’s Good Morning Cookbook: Breakfast, Brunch, and Baking . 1. In a medium saucepan cover the potatoes with lightly salted water by 1 inch, bring to a boil, reduce to medium and cook until tender, 15 minutes. Drain, transfer to a large bowl, mash the potatoes with 2 TBs of the butter, then stir in the milk. Cool until tepid (but not cold). 2. Heat waffle iron according to manufacturer’s instructions. 3. In a food processor pulse the flour, baking powder, salt and pepper 5 times. Add remaining 3 TBs butter and pulse until mixture is coarse, 15-20 times. 4. In a small bowl whisk the egg and crème fraîche. Add the flour mixture to the potatoes in thirds, alternating with two additions of crème fraîche mixture, gently folding each time; fold in the chives. 5. Grease the waffle iron with the clarified butter; pour 1/2 cup of batter into the waffle iron, close and bake until crisp, 4 to 6 minutes. Repeat with remaining batter. Serve with crème fraîche, gravlax, lemon slices and chives. Soft and custardy on the inside, crisp and buttery on the outside, this is French toast heaven. A quick trip to the oven gives the sautéed French toast extra lightness. Sarabeth uses halla, a golden braided bread from the Jewish baking tradition. Other egg-rich breads, such as brioche or Greek egg bread, are also perfect—see what your bakery has that will fit the bill. Serve with maple syrup and butter or a fresh berry sauce. 2. In a medium bowl, whisk the eggs, milk, superfine sugar, vanilla, and nutmeg. Strain through a fine-mesh sieve into a shallow bowl. 3. Pierce the bread slices all over with a fork. Add a few bread slices to the egg mixture and turn until evenly soaked. 4. Brush the griddle or skillet with clarified butter. Add the slices of bread in a single layer, spacing them 1 inch apart, and cook until the undersides are golden brown, about 3 minutes. Turn and cook until the other sides are golden, 2 to 3 more minutes. Stand each piece of French toast on its cut side and cook for 1 minute. Transfer to a parchment paper–lined half-sheet pan. Repeat with the remaining bread and egg mixture. 5. 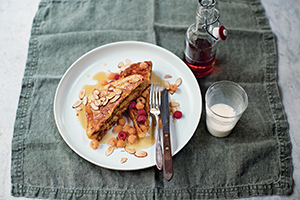 Bake the French toast until slightly puffed and cooked through, 7 to 10 minutes. Serve immediately on warmed plates, dusted with confectioners’ sugar, passing warm syrup and softened butter on the side. 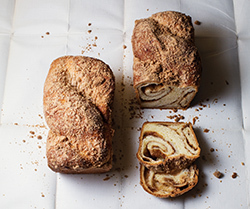 Sarabeth uses a babka rolling technique here so that the cinnamon sugar spirals all throughout the twists and turns of the soft dough. 1. To make the streusel: In a small bowl, mix the flour, superfine sugar, brown sugar, cinnamon, salt, and butter with your fingers until combined and crumbly. Set aside. 2. In another small bowl, mix the brown sugar, superfine sugar, and cinnamon; set aside. 3. Lightly dust a work surface with flour. Place the dough on the work surface and dust lightly with flour. Roll out the dough into an 18 by 10-inch rectangle, with a long side facing you. Brush the well-softened butter over the surface, leaving a 1-inch border on all sides. Sprinkle the sugar mixture over the butter. 4. Starting at the top, tightly roll up the dough. Brush the empty border of dough with the beaten egg and pinch the seam closed. Roll the dough back and forth underneath your palms to seal the seam securely. Push the ends in on each side and roll again to stretch the log to 18 inches. Fold the dough roughly in half to form a U-shaped curve, with one side 3 inches longer than the other. Using the side of your hand, press a dent into the dough at its bend. Fold the longer length of dough over and around the shorter length twice to make two humps. Twist the dough lengths to create a third hump and tuck the two ends under the loaf. You should have a loaf about 9 inches long with 3 humps. 5. Generously butter a 9 by 5 by 3-inch loaf pan. Transfer the dough to the pan, being sure that the ends are well secured under it. Gently brush the softened butter all over the top of the dough. Sprinkle the streusel over the top, patting gently so it adheres. (Don’t worry if some of the streusel falls into the corners or sides of the pan.) Place the loaf pan on a half-sheet pan. 6. Choose a warm spot in the kitchen for proofing. Slip the pan with the loaf pan into a tall kitchen plastic bag. Place a tall glass of hot water on either side of the loaf pan to keep the bag from touching the dough. Wave the bag to inflate it and tightly close it, trapping air in the bag. Let stand until the loaf rises 2inches above the rim of the pan, about 45 minutes. 7. Position a rack in the center of the oven and preheat to 350°F. 8. Carefully remove the glasses from the bag, then remove the pan. Bake the cake on the half-sheet pan until the top is deep golden brown, the dough in the crevices looks fully baked, and an instant-read thermometer inserted into the center of the cake reads at least 195°F, 45 to 50 minutes. If the loaf threatens to burn, cover the top loosely with foil. 9. Cool in the pan on a wire rack for 10 minutes. Carefully unmold the cake onto the rack and let cool completely right side up. 10. To serve, slice the cake with a serrated knife. 1. If using compressed yeast, in the bowl of a heavy-duty stand mixer, combine the crumbled yeast and sugar. Let stand until the yeast gives off some moisture, about 3 minutes, then whisk well to dissolve the yeast. Add the sour cream, lemon juice, vanilla, and egg yolks and whisk well to combine. Whisk in the milk until smooth. (Or, if using active dry yeast, in a small bowl, sprinkle the yeast over 1/4 cup lukewarm milk. Let stand until the yeast softens, about 5 minutes, then stir to dissolve. Pour into the mixer bowl. Add the sour cream, lemon juice, vanilla, and egg yolks and whisk well to combine. Whisk in the remaining 1/2 cup cold milk until smooth.) Attach the bowl to the mixer and fit the mixer with the paddle attachment. 2. On low speed, gradually add half of the flour and then the salt. Mix until a sticky, batter-like dough that clings to the sides of the bowl forms. Increase the speed to medium. Beat in half of the well-softened butter, 1 tablespoon at a time, letting each addition be absorbed before adding another. Replace the paddle attachment with the dough hook. Mix in half the remaining flour, then the remaining butter, and then the remaining flour, letting each addition be absorbed before the next. Knead on medium-low speed until the dough is smooth and soft, about 5 minutes. 3. Transfer the dough to a lightly floured work surface. Knead briefly to check the dough’s texture. It should feel slightly sticky but not stick to the work surface. Knead in more flour only if needed. Generously butter a large bowl. Shape the dough into a taut ball. Place in the bowl, turn to coat with butter, and turn smooth side up. Cover tightly with plastic wrap. Let stand in a warm place until the dough doubles in volume, about 45 minutes. 4. Working carefully to preserve the dough’s light and puffy texture, turn the dough out onto a lightly floured work surface. (Do not knead the dough.) Cut the dough in half and shape each piece into a 1-inch-think rectangle. Cover with a kitchen towel and let rest for 15 minutes before using. If not using immediately, do not let the dough rest. Instead, immediately wrap each half tightly in plastic wrap and freeze for up to 2 weeks. To use the frozen dough, transfer to the refrigerator and let thaw for at least 8 hours, or up to overnight. feel like I know you – I’ve heard so many good things about you. I have printed this wonderful and enticing article and maybe some day, we really will meet up in person. Best Wishes from a good friend.